A USDA report indicated Florida orange production dropped 1 percent this month. 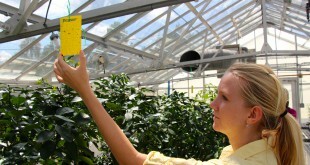 Researchers and growers have pointed to citrus greening as the prime culprit. Farmers could lose up to 20 percent of their citrus crop due to overproduction. A drop in Florida citrus crops could potentially increase prices for consumers. UF, the USDA and citrus growers have been investing time and money to come up with "aggressive" research methods to fight Greening and citrus canker.